Quit The Gym and Get Stronger — Go Polymath! It was just a few plates on each side. Maybe five. Nothing crazy. Yes, I had been focused on drinking malbec and eating steak for the past six days in Argentina, but that was a scheduled “off week.” Where programming is concerned, I’m extremely fastidious. Besides, we all know how heavy you can go on the leg press, and I wasn’t even close to that yet. I was warming up my legs, adding a couple of 45-lb plates to each side after each set as I pumped blood through my muscles and tendons. It was a process I’d gone through at least once a week for the past 12 years. And then, at the base of the eighth repetition, my knees just touching my chest because I go all the way down (maximum range-of-motion being a point of great pride), I felt a strange sensation radiate through my lower back and hips. It wasn’t exactly painful but it was unfamiliar which is more disturbing if you’ve been around a few years. I pressed the weight back up slowly and locked out my knees at full extension. A montage of fear flashed through my mind while I took a few deep breaths. It had been 8 months since I did the Texas Shredder (natural bodybuilding show in Austin, TX), and I had plans to compete in powerlifting again later in the year. I was healthy. Stuff should work. But my lower back suddenly felt like a foreign body part, a faulty transplant from a weaker man. When I stood up out of the leg press it felt like my right hip was higher than my left. And 13 minutes later I had to be helped out of the gym into a waiting vehicle. I would not be able to stand up for the next 2 days. That happened a few months before I turned 33. Today I am 38, and still occasionally deal with the effects of herniated discs in my back. The impact this has had on my life has felt interminable, excruciating, and, at times, terrifying. But I love the gym, so I kept going back. Until this year. This year I stopped going to the gym and started to train outside instead. And you know what happened? I got stronger. I look better. I feel better. And while this remains the case, I won't be going back. How many times have you tweaked something while working out in the gym? How many times have you sidelined yourself because of time spent exercising with weights or machines? If you’re like most people my age, it’s too many to count. But maybe you are one of the lucky ones who has made it this far injury-free? Well, at the very least, you know quite a few people who are absolutely wrecked physically as a result of their exercise endeavors. Maybe you are just looking for a change in the way you approach your fitness? Perhaps you appreciate that being "healthy" involves a lot more than just an exercise-eat-sleep cycle, and that your body is a complex organism that needs more than squats and curls in order to be optimal? Whatever the reason, taking a break from the gym and training outside can be an absolute game-changer for you. In this article I'll outline a basic training template that will allow you to get stronger while incorporating simple practices that can improve the balance of your health in the process. My overall health began to improve when I started asking appropriate questions. For example, why was I able to do 20+ pull ups with ease, but a strict muscle-up seemed impossible? Why could I close-grip bench press over 300lbs but struggle to do a single handstand push up? Why couldn’t I do an L-sit at all? Way harder than it looks. And how could the lizard walk be so incredibly difficult if I was in “good shape”? The answers lie, of course, in improving relative strength and actually training these particular skills. Relative strength differs from absolute strength in that you are focused on being as strong as possible at your particular body weight--rather than the maximum amount of weight you can move through space. I realized that my body was highly efficient at executing certain movements, in certain ranges of motion, but still lacked a completeness I aspired to. So I needed to change things. I learned that leverages become more important as you focus on bodyweight exercises, and the greatest gaps in your strength become instantly recognizable. The good news is, just about anyone can do these skills, provided they put enough time into training them. But also: why did I feel better when I did my workouts outside? Why did I get deeper sleep when I got in the sun or trained in bare feet? Why did I feel so invigorated when I was out of breath in the fresh air? And why wasn't anyone else talking about these things as if they were valuable to our overall health? There are three huge benefits of training outdoors, according to Dr. Jeremy Wiseman at Wiseman Family Practice. Sunshine is absolutely crucial to optimal health and disease prevention. The problem is, most people spend their days moving from one shelter to the next. And as a result, a good majority of the population is completely deficient in Vitamin D.
We can go a long way toward improving that imbalance by training for 30 minutes in morning or evening sunshine. Of course, if you burn easily or have other health limitations, use common sense when spending a lot of time outside. But this is just about the easiest change you can make to your exercise regimen to improve your overall health. Fresh air can give us incredible feelings of energy and actually boost the immune system. But many of us go from one filtered environment to the next: from the air-conditioned house to the car to the office to the restaurant. If you are spending time in the gym that is just one more filtered environment--and it's probably permeated with commercial-strength disinfectants, too! Not only do you miss out on clean oxygen, but if you train with any intensity you'll be sucking in noxious air at an increased rate. Finally, while the proven benefits of earthing--coupling your body to the earth’s surface energy by walking, sitting, or sleeping in direct contact with it--are still largely considered pseudoscience, I encourage you to try it for yourself. I challenge you to spend at least 10 minutes barefoot on the dirt, grass, or sand and tell me you don't feel better afterward. I can’t deny that I do, even if there isn't a lot of data explaining why. When I do the majority of my physical training barefoot I feel fantastic. And if you think about how little the average person actually connects with the earth, particularly if they live in urban areas, this small change could provide a tremendous benefit. You are going to "train" every day. Surprise! For three days a week that means strength workouts--the other days are going to be cardio-based training sessions. But have no fear, because no training session is longer than 30 minutes. You will begin every daily session with a 5-Minute Warm Up, and if you want to see even bigger changes, end each session with a 5-minute meditation. This is the same for strength training and cardio days. Since I want you to get out of the gym, this routine requires very little. Most of the movements can be done with just your bodyweight. However, if you have a couple of dumbbells, kettlebells, sandbags, or some other form of external resistance you will be able to go further with your progressions. I can't stress the importance of training pulling movements enough. From yogis to runners, I see chronically under-trained backs. 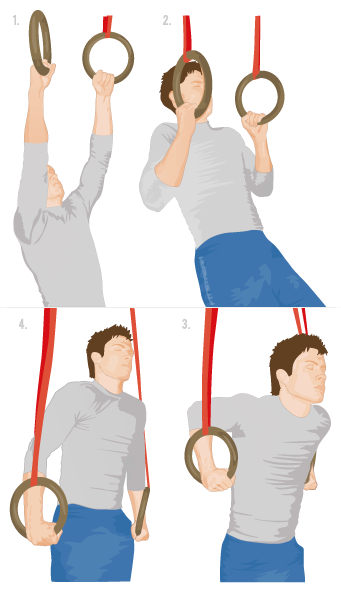 If there is anything I recommend that you do have, it is a pair of rings or a pull up bar. Make training pulling movements a priority and watch your whole physique improve. You will choose one movement in each pattern for a total of five different exercises. You will do the first exercise, move on to the second, third, fourth, and fifth. That is one "round." You will rest 45-60 seconds between exercises. On day one you will do 8 repetitions, on day three you will do 10 repetitions, and on day five you will do 12 repetitions. You will do this same workout three times over the course of the week with a day of rest in between. Every week you can choose a different combination of exercises to perform. You will write down all of your progress! Your goal in every strength workout is to get through 3 rounds of each exercise in 20 minutes. On the days when you're only doing 8 repetitions per exercise (Day 1 in every week), this won't seem that outrageous. But by the third strength workout of every week when you're doing 12 of everything (Day 5 in every week), it will be far more challenging. While I understand that you may be training around your own unique limitations, for optimal results you should stick to the plan as closely as possible while making sure you are mitigating risk of injury. These are really up to you in terms of how you want to move. When I'm short on time, I just do 20 minutes of Animal Walks or brisk walking in the neighborhood. Do whatever is sustainable for YOU. Do three rounds of 8 repetitions for each exercise. Find a quiet place to sit. Relax. Enjoy the post-workout calm that is coming over you. Breathe normally. Observe, but do not engage with, your thoughts. Pay attention to how your mind is working. If you find that the movements are too easy for you, move on to the next progression or increase the load. However, be aware that each strength workout will increase by 2 repetitions per movement, per workout. I would much rather you get all the repetitions on Day 5 than have to stop halfway through because you overestimated what you could do. Again, 1 round of this isn't that big of a deal for people in decent shape. But 3 rounds in 20 minutes is going to challenge you! If, on the other hand, you find that the movements are too difficult, move to an easier exercise, lighten the load, or shorten the range of motion. I would rather you get all of the sets and reps doing something that you can perform under control than have you risk quitting the workout because you are discouraged. And you definitely don't want to risk injury knowing you have to train every day! But be brutally honest with yourself: avoiding something because of legitimate pain is different from avoiding something because it's uncomfortable. Find ways to improve while staying injury-free, start incorporating exercises that challenge you while being sustainable, and enjoy feeling your body change! You may not need to be physically capable to navigate the human experience in the 21st century. But I can’t think of a single reason why it wouldn’t be beneficial. And if you have a body that functions properly for the most part, you have the means and the privilege--Socrates would call it an “υποχρέωση” (obligation)--to achieve that. However, it doesn't necessitate a gym or a bunch of exotic equipment. You can build a formidable physique without much at all, and you can reap all the benefits of being outdoors at the same time. So take a break from the gym. Get outside. Kick off your shoes. And get moving! PS--Are you looking to make a massive change in the way you think, eat, and move? Click the image below for a comprehensive 4-week course that integrates cold water therapy, meditation, farm-to-table nutrition, and 30-minute workouts.